This weekend was glorious, the first truly adequate batch of weekend weather we’ve had in 2013. Germany’s cold slate ceiling opened to reveal the blue of ocean skies, a hundred miles inland. My eyes swam in the sky, a deep, nearly periwinkle blue, and soaked in the sunrays. The spring breeze whispered over everything, and the city of Stuttgart felt content, alive, healthy again. Cafe Grand Planie opens with a glass display case of dazzling cakes and tarts, surprises you on the wall with a reproduction of Otto Dix’s neon “Großstadt” triptych (the real one is nearby at the Kunstmuseum), and stretches way past a bar, a huge sprawling room of cafe tables, booths, chandeliers, and towering vases of flowers. It feels cosmopolitan European, full of lively conversation and clinking mugs and saucers. Even in warm weather, I can’t resist house-made soup. And today’s special turned out to be Bärlauchsüppchen. My first guess was barley soup, but I was wrong – the real soup was even better: “Bear’s Garlic Soup”! Bear’s Garlic is apparently wild garlic, a European relative of the North American ramps. I had seen these long, beautiful leaves at the market that morning, like basil crossed with baby palm fronds, but I hadn’t know what they were. I realize now they were Bärlauch, perhaps (as the menu description says) the first of the season! The soup was delicious, warm and savory and thickly garlic and buttery, with a tender shrimp dangling overhead. With a big hunk of crusty bread to mop it up, my first Bärlauchsüppchen was a sweet welcome to an overdue German spring. I was thinking perhaps I’d follow the blog trend of snappily listing links on Fridays. I’m reading this. I’m watching this. But my first link, beginning with the week’s reads, was off and sliding on a tangent. So I’m going to go with that today, like cooking up a combination based on what’s in the fridge. Please me know if this post was delightful or jarring. Thanks! I’m on a classics kick. In reading, not in cooking, though perhaps I should take direction from one to the other. I missed a great deal of the literary classics somehow, so I’m slowly making up for it. It’s never too late for the good stuff. Classics, some devoured, some awaiting me yet. What else should be in this stack? Each one seemed to draw out human nature and shine a light on it. Each one seemed alive in my head for weeks afterwards. Each one felt both weighty and ethereally light. And any bit of thought produced a mosaic of truths. The writing felt more solid than what I was used to, a technique had been honed not for the purpose of flashiness but for the purpose of precision. Like cooking by the masters. This week, I read “Of Mice and Men,” my first Steinbeck, I’m embarrassed to say. It was shorter, easier to read than I imagined. I somehow put the mighty American novelists on a shelf of difficulty, but it’s not that way at all. Maybe I’ll make my first Julia Child recipe soon. Maybe I’ve underestimated the approachability of the masters. “Of Mice and Men” transports the reader to California in the 1920s, to a world of male companionship and hard knocks and blatantly unfair lives. And yet there’s compassion and sweetness, and your heart leaps for what you see coming. I also picked up three Richard Yates novels in an Everyman’s Library collection; Everyman’s are such wonderful editions, with a perspicacious introduction, a timeline, and that lovely Dijon-colored ribbon bookmark. I’m starting with Yates’ “Revolutionary Road,” which so far is filled with startlingly sharp and tight dialogue, the tension between a married couple. The novel opens with a community play starring April Wheeler, a tall ash blonde of 29, a suburban mother of two who “moved with the shyly sensual grace of maidenhood.” The Connecticut audience is rustling with anticipation, as are you. And then you read, in alarm, the calm recount of how the leading man is suddenly ill, how the director steps in, and how the play unravels into awkwardness. And that’s just the first 15 pages. So many layers, so many things to simmer in my brain while I chop and stir and wash. I had spied this strange pale green guy at the market long ago. I wondered what it was. A blanched beet? A spidery wild cabbage? A leafy green married to a veggie tuber? But as this interminable German winter is dissipating, I thought – who cares what it is! I better buy one soon! What if this little alien decided to lift off and disappear? My line-up of Kohlrahi. Can you identify the perpetrator? And so, here we are. Faced with Kohlrabi, aka a German turnip. I felt rather certain that I hadn’t seen this vegetable before and that it would be missing in action from my favorite cookbooks. But nope. There it was. Peeling was recommended, but first, I wanted to peek inside. I trimmed the arms off, turned it over, and sliced it in half. Here’s the inside. It looked rather like the inside of an apple or a radish to me. Having no earthly idea what to do with it, I hacked it into slices. The taste is very fresh, sort of like the great hit you get from an apple straight from the tree – but not sweet. Raw Kohlrabi is crisp, like a radish, but with the flavor impression of a snap pea plucked from a garden tendril. Very nice. But I couldn’t eat all that raw Kohlrabi. I needed to cook it. Kohlrabi gratin? Kohlrabi risotto? Roasted Kohlrabi? I was still confused what Kohlrabi would taste like cooked, so I turned to “The Flavor Bible” for ideas. It recommended, among other things, soy sauce. Recommended cooking techniques included stir-fry. 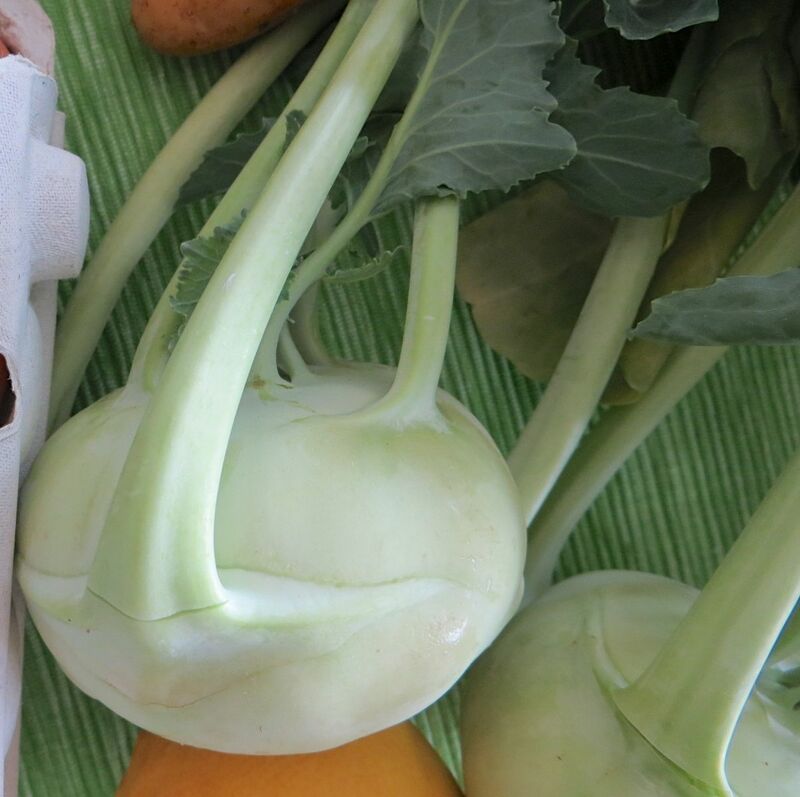 The Kohlrabi softens nicely, with a clean, savory taste that fit in with everything else well. I even got daring after a test bite and squirted fish sauce over the entire pan! 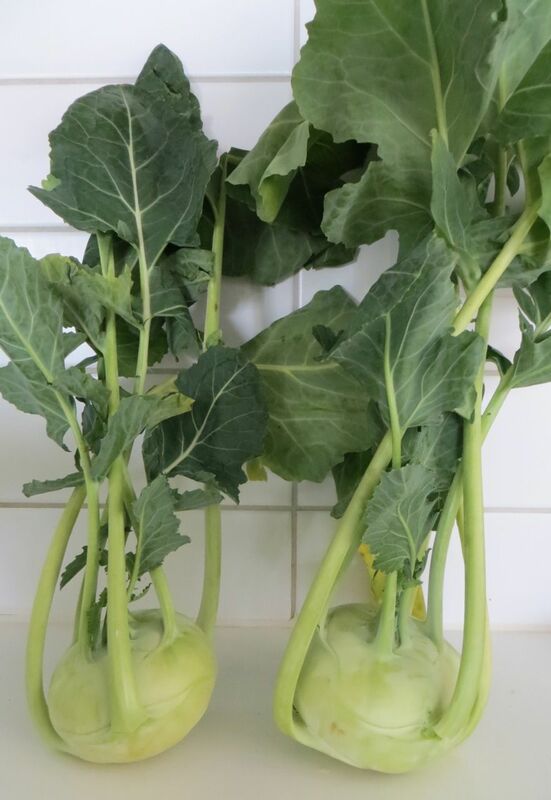 Kohlrabi turned out to be simpler to deal with than other veggies, like artichokes or even pesky broccoli with all its florets. I think Kohlrabi will definitely be circling for a return visit. This winter has been Germany’s darkest in recorded history, with the fewest hours of sunshine ever. The sky is a perpetual stretch of muted gray, as blank and listless as concrete. A drifting of clouds is cause for celebration, and any sighting of the golden orb leaves me blinking like a maulwurf. And just a few days into spring, it snowed. So I’d like to be writing about grilling. About the first bundles of Italian white spargel (aparagus) and baskets of shiny strawberries at the market. About picnicking in a new-found park, a blanket on prickly new grass under the young sun’s rays. But instead, I’m still in soup season. This soup is a quick and easy version I made up with the spinach and leeks I bought at the market. It feels enormously comforting, both because of its savory, pick-you-up taste and the plethora of good-for-you vegetables. Here’s where I cut off the darker, tougher leaves. You can use eat them, certainly, but you’ll need to cook them rather voraciously, I think, to mellow out their strength. Any ideas how to use them? And is this about where you trim your leeks? Chopped up leek curls, ready to be cooked. In a dutch oven or other pot, cook the leek curls on medium heat in a swirl (1-2 tablespoons) of olive oil and/or butter. Don’t abandon them, as they’ll need a stir every so often to prevent scalding. If the leeks are beginning to develop brown spots, the stove is too hot; turn it down to medium-low or low. Wait until the leeks have softened, maybe 10 minutes. Try one to see if its lusciously soft enough for you. While the leeks are cooking, I made a batch of cornbread (recipe to come), but rice would have been nice, too. If you’d like a side, now’s a good time to tackle that, assuming it’s fairly simple. Once the leeks are softened to your wishes, add the sliced garlic. Let it cook a minute or two. Then add the beans, the tofu, and the broth. Let it come to a simmer. Add a good sprinkle of dried herbs and pepper. Taste and adjust. It may need more herbs; it may need salt; it may need a sprinkle of Worcestershire sauce to jazz it up. A lot will depend on the intensity of the broth. Let it simmer for a little while, maybe 5 minutes, maybe 10 minutes, depending on what else you need to do in the kitchen. Let it take its time. You may want to sample it one more time. (One of the lovely perks of being the cook.) If you are feeling like the broth is too subtle, try red chili flakes for a kick or a bit of grated cheese on top, once you spoon the soup into bowls. When all other parts of the meal are ready, add the spinach. Give it a good stir, and let the spinach cook for a minute or two. If you like the spinach simply wilted, then don’t even wait that long – you are ready to slurp the soup and warm up.